allow for substantially improved intonation on Telecaster-style guitars with a three-saddle bridge. 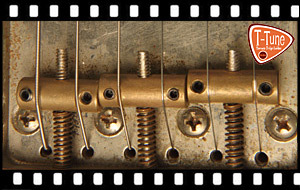 The classic headache associated with the traditional Telecaster-style three-saddle bridge is that intonation can only be set per pair of strings. The result is a “compromise” intonation, with all strings being either slightly sharp or slightly flat of their 12th-fret harmonic. T-Tune Harmonic Bridge Saddles eradicate this problem simply and effectively. Slots in the saddles shift the point of contact between string and saddle, making it possible to achieve the more accurate string-length settings found on bridges with individually adjustable saddles. The string rests inside the slot, almost completely covering it. No intonation problems occur as a result of sideways slipping of the strings (just like saddles that have been drilled at an angle). No sharp bending of the string (reduces the possibility of string breakage). Can also be used on Left-handed guitars. Can be used with plain or wound G-string. You don’t see the difference between your old saddles and T-Tune Harmonic Bridge Saddles – you just hear it! You’ve already bought a set of T-Tune Harmonic Bridge Saddles? Click here for instructions on fitting and setting up.